The Saskatchewan-focused energy developer will pay Cameco C$16 million for its 24-percent stake in Wheeler River. 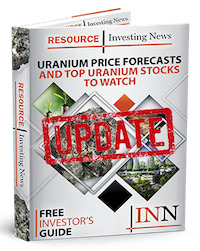 Uranium-focused Denison Mines (TSX:DML,NYSEAMERICAN:DNN) will purchase Cameco’s (TSE:CCO,NYSE:CCJ) minority interest in the Wheeler River uranium project for C$16 million. Denison already holds a 63.3-percent majority interest in the project. Cameco possesses 24 percent, and JCU has 10 percent. “We are pleased to have reached an agreement with Cameco to acquire their remaining minority interest in Wheeler River. Denison, Cameco and JCU have worked together, since 2004, to advance Wheeler River to the point of being the largest undeveloped uranium project in the eastern Athabasca Basin,” David Cates, president and CEO of Denison, said in a press release. The Athabasca Basin of Saskatchewan is well-known for its uranium deposits, in fact, Cameco recently shuttered its McArthur River project in the area indefinitely. McArthur River is one of the largest uranium deposits in the world, accounting for 17 percent of global supply. The Wheeler River project is also located in North Central Saskatchewan, situated along the road and power grid system that runs between Cameco’s McArthur River mine and the Key Lake mill complex. The Wheeler River site hosts the Phoenix and Gryphon uranium deposits, which are estimated to contain a combined indicated mineral resource of 132.1 million pounds U3O8 at an average grade of 3.3 percent U3O8. There is also a combined inferred mineral resource of 3.0 million pounds U3O8 at an average grade of 1.7 percent U3O8. Its stake in Wheeler River isn’t the only acquisition Denison is making from Cameco. Following the announcement of the C$16-million deal, Denison reported the appointment of Tim Gabruch as VP commercial. Gabruch served as Cameco’s VP marketing from 2011 to 2017. The next move for Denison will be awaiting the completion and results of the Wheeler River prefeasibility study, which is expected to be completed by the end of the third quarter. Denison shares were down 2.94 percent at 12 p.m. EST trading at C$0.66.